Update: Official Verizon Galaxy S7 and S7 Edge Android 8.0 Oreo is now available for download as full stock firmware update. 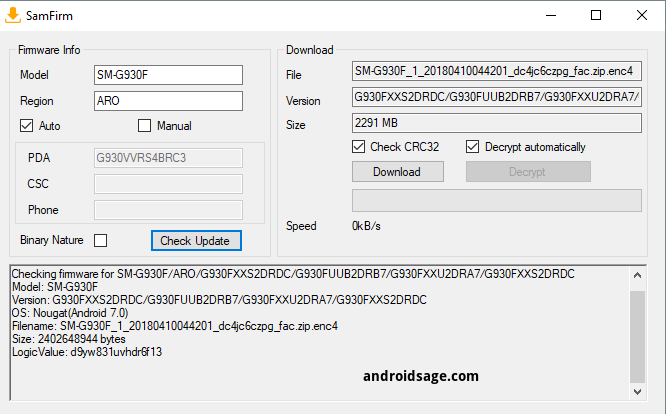 It comes with new firmware build number (Baseband versions) G930VVRU4CRE5 and G935VVRU4CRE5 for S7 SM-G930V and S7 Edge SM-G935V respectively. So download and install the latest Oreo ROM for Verizon S7 featuring May 2018 Security Patch. Samsung is now rolling out the official Android 8.0 Oreo firmware update for some of its stunning Galaxy series smartphones. These devices include the Galaxy S8 or S8+, Note 8, and the Galaxy S9 or S9+ comes with Oreo out of the box. The manufacturer has now started rolling out the Samsung Experience 9.0 based Oreo firmware update for the Galaxy S7 and S7 Edge in the regions of USA. Carriers like AT&T have already rolled out Oreo update for the S7. Now, its is time for the Verizon carrier. Today, the official page of Verizon Galaxy S7 and S7 Edge displayed the latest Android 8.0 Oreo OTA update for the SM-G930V and the SM-G935V. This comes with a new firmware build number G930VVRS4BRC3 and G935VVRS4BRC3 respectively. Moreover, it features the latest April 2018 Android Security Patch. As it is Oreo, it sports the latest Samsung Experience 9.0 (SE 9.0); formerly known as TouchWiz. With the Oreo OS, Verizon claims it to be smarter, faster, more powerful than ever. It also features background limits that helps minimize background activity in the apps. Autofill will remember your usernames and passwords and fill them up automatically for each app or website. Not to forget the exclusive Picture-in-Picture mode of the Oreo update. The build R16NW.G935VVRU4CRE5 is now available for download. 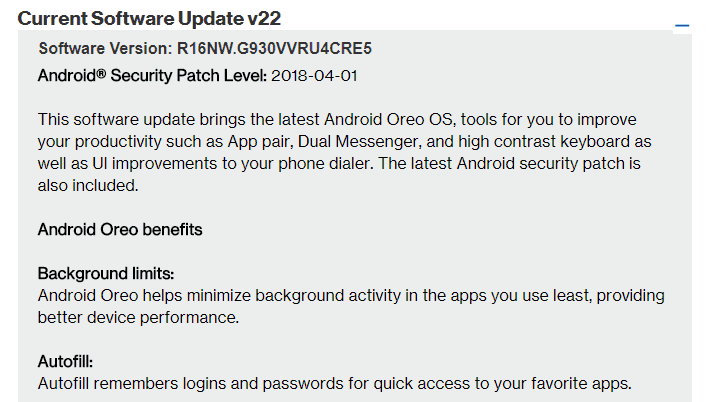 The Verizon support page states that the CRE5 update is being rolled out with Oreo OS and is the April 2018 Security Patch. You can visit our tutorial on how to download stock firmware directly from Samsung Servers for your Galaxy S7 and S7 Edge devices. See how to download latest available full stock Odin firmware. Download the latest stock firmware for Verizon Galaxy S7. Read: How to install using Odin tool? Alternatively, there are ways to update the Verizon S7 to Oreo. You can download the AT&T Galaxy S7 Oreo firmware and install it on the Verizon device. Download the latest AT&T Galaxy S7 Android 7.0 Nougat firmware Download G930AUCS4BRA1. Download one of the Oreo OTA update from below. CRD6 is the latest one. Transfer all the Oreo OTA update file to device storage internal or SD card. This is the official update!